Place your original document on the scanner glass. Press the arrow buttons to select Copy, then press the OK button. 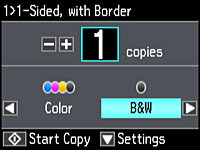 Press the down arrow button and select Paper and Copy Settings, then press OK. Select Quality and use the left or right arrow to select Draft as the quality type.